So this project all started with a wall chalkboard I spotted at TJ Maxx last weekend. Long story short, I didn't buy it when I saw it....then proceeded to obsess over the project I had in mind ALL WEEK. Lucky for me, it was still there when I went back Saturday. This chalkboard was super cute as-is, but instead of using it for my wall, I had big plans for it on our dining room table. I loved the round shape, and the detail on the frame. It also helped that it was originally priced at $59.99 marked down to $29.99. Our dining room has pops of gold as an accent, and I thought this would look really cute once spray painted gold in the center of the table. The chalkboard got covered in paper and taped down so spray painting in the basement could commence! I used my *fave* gold spray paint again for this project, Design Master in Gold Medal. Here it is after being painted and cured in the basement overnight. SO shiny! There's always the inevitable places where the spray paint bleeds through. I found it was super easy to remove any overspray with a good old Magic Eraser. The frame details seemed to pop even more once it was painted gold. Here's my completed chalkboard centerpiece on the dining table. It's large enough to still accommodate a fun basket w/ some green moss balls. I think it will be really fun to change the chalk messages for different occasions, holidays, etc! You can see a few more of the gold accents in the room in this bigger picture. I'm really happy with how it turned out! 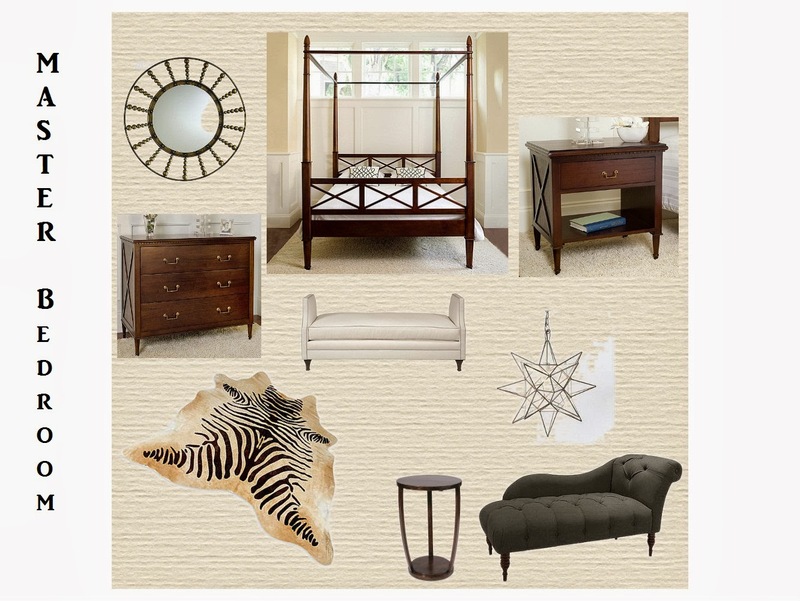 I had some free time tonight to put together elements for our master bedroom. Gotta love being snowed in! None of these are definite keepers, but the general idea is one I really like! The four poster bed would be perfect since we have high ceilings to take advantage of. We also have a sitting room area in our bedroom now, so I'm thinking the chaise lounge would be nice. The Moravian star pendant would dress up that area a little bit too. Olioboard is so awesome for brainstorming!